As promised previously, here's my first review in the Revomaze series, available from Revomaze and also in limited numbers from PuzzleMaster. The first puzzle from Revomaze is the Blue. I have the extreme version which is the heavier, and also more expensive version of this puzzle. It's also available as a plastic puzzle called the Obsession which is much lighter and cheaper. I'd recommend the plastic puzzle if you want to try out the puzzle before the more significant investment in the metal puzzles, but there are differences between the puzzles which I'll point out later that are worth being aware of. The biggest difference between the two puzzles is that the weight of the Extreme is a big challenge in itself. At 600g these are heavy puzzles, and do take some getting used to. Your hands, wrists and fingers will find it difficult to work for more than 5-10 minutes initially on these puzzles before getting tired and sore. Don't overdo it, short sessions are a must. The plastics are light and don't have this added challenge so may be easier to get to grips with (pun intended). The quality of the build and machining of the metal puzzles is excellent. This is a really high-end puzzle, and it is worth the asking price. It's really hard to damage these puzzles as well, so you can happily pass this to friends to try, and short of dropping it end first on the floor, it's not going to come to any harm. This is one puzzle line that you should be able to pass down to your kids one day. The object of all the puzzles in the series is to remove the core into which the maze is etched from the shaft of the puzzle by pushing, pulling and twisting the shaft to navigate the maze. There is an indent of the coloured sleeve, and a corresponding one of the shaft, which once lined up will allow the shaft to be removed from the sleeve. 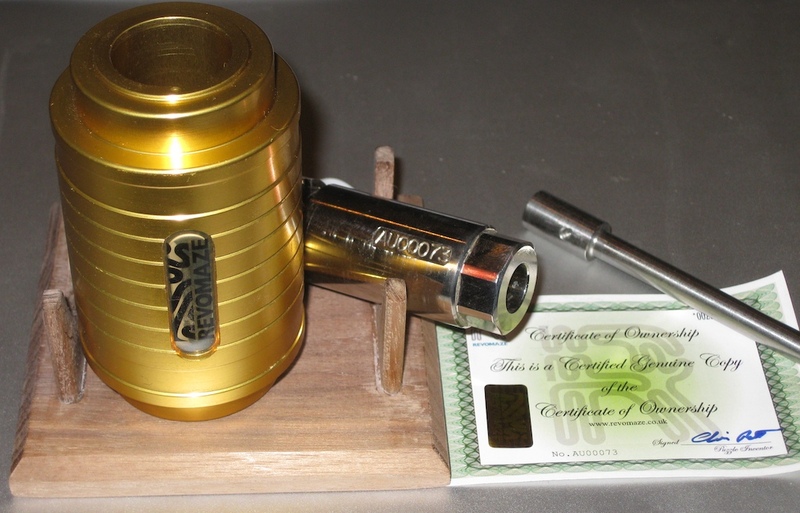 Once you have opened the maze, you are presented with a certificate and a clear plastic map which are wrapped around the inner draw of the puzzle. Note: On the Obsession line, the shaft cannot be removed from the sleeve to see the maze without breaking the puzzle. There is also no clear plastic map as the Obsession line does not qualify for the competition which this plastic map is part of. Sounds simple right? The really clever part about the puzzles is that the maze is not one-dimensional. It's not even two-dimensional! The mechanism that makes the puzzle work is the spring loaded pin which is used to navigate the maze. The pin rides on top of the maze, and is being pushed against the maze by the spring which is located in the coloured sleeve. This allows the maze to operate on several levels, one of which is the dreaded reset line. The puzzle has a unique system where if you make a wrong turn, you can 'fall off' the maze, into a reset line with a satisfying click, at which point, the only progress is back to the beginning! This isn't like an ordinary maze then where you can follow the walls and make it to the end. There are parts of the maze where one wall or both walls are removed leaving the pin free to fall into that reset if you're not careful. Early on in even the blue, there is a tricky section, where you can fall into a reset, and it seems that there is no way to progress. Don't be disheartened though, your puzzle isn't broken, and there is a way forward. The only advice is to map the path, and map the reset lines. If you still can't make progress, then map better! Blue is rated by Revomaze as having a difficulty of 50/100 (challenging) and an estimated opening time of 6 hours. It is described as a static maze and really is an introduction to the series. There are enough twists and turns in the puzzle to keep you busy for a good few hours, and in total it took me around 4 hours to open this puzzle for the first time. There's one spot in the puzzle that gets everyone, leaving many saying "There's no way to progress. My puzzle is broken". As we have all found out, there is a way, the challenge is in finding it. The one word of warning I'll give is that if you do decide to buy one, and I highly recommend you do, you'll end up getting more. After solving one, there are few who can resist coming back for more. I'll be reviewing the rest of the puzzles in the series in the coming posts, so check back for info on the rest of the series. As promised previously, here's the second review in the Revomaze series, available from Revomaze and also in limited numbers from PuzzleMaster. The second puzzle from Revomaze is the Green. Again, I have the extreme version which is the heavier metal version of this puzzle. Again it's also available as a plastic Obsession version. The Green is rated by Revomaze as having a difficulty of 60/100 (challenging) and an estimated opening time of 10 hours or just 3 hours if you've already opened the Blue puzzle. It is described as a static maze and really is a nice step up in the learning curve for the series. The puzzle introduces a new element not seen in the Blue puzzle, and extends the trickier sections from the Blue to be really very challenging in this puzzle. It is a nice step up from the original puzzle, and took me around 5 hours to open. Mapping the maze in this puzzle definitely helps in the trickier sections. If you were to try to solve this as your first puzzle in the series, it's definitely harder, but not impossible. That reset line is ever present in this puzzle and there are many more blind turns to throw you off the correct path. As promised previously, here's the third review in the Revomaze series, available from Revomaze and also in limited numbers from PuzzleMaster. The third puzzle from Revomaze is the Bronze. This puzzle isn't available as a plastic puzzle, as it's not possible to create some of the internals in plastic. 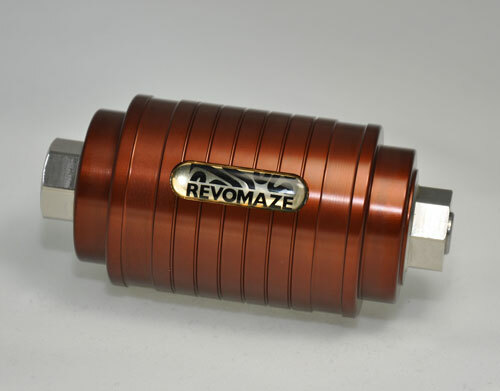 The Bronze is rated by Revomaze as having a difficulty of 80/100 (extreme) and an estimated opening time of 40 hours. It is described as a dynamic maze and is the first puzzle in the series that really challenges you to think as well as feel your way through the puzzle. This is a big jump up from the Blue and Green puzzles, and this is where many people seem to get stuck in the series. It's no longer just a simple maze to get from the start to the end. There are obstacles in the way which you really need to think your way around. The first big challenge you meet in the Bronze after only six moves is lovingly referred to as "The Pool". This is a trap, with no easy way to reset the puzzle. So from the first few turns in this puzzle, it's clear that the rules you thought you knew have been broken. Also gone are the nice straight lines you have been used to in the previous two puzzles. This one is full of curves, which adds an extra challenge. The puzzle falls into three sections, with some real thinking required to move from one section to the next. To begin with, you can only move through around the first quarter of the space available in the puzzle, with no seeming way to move further. The way forward is in understanding the new elements in this maze, and getting over the feeling that "You know how this works" and "That can't be possible". The biggest challenges in this puzzle are your assumptions as to what is happening inside. More often than not they're wrong. The key to solving this puzzle, as with most of the puzzles is in creating the best map you can. You should also be used to how the pin feels when it's in the maze by now, and that is key to understanding what's going on. The dexterity required here also goes up a notch, and having toughened up your fingers on the previous puzzles will certainly help. It took me around 6 hours to open the Bronze, but I'll admit I had already played a little with the Silver before I attempted Bronze, so I understood some of the new mechanisms that were introduced in Bronze, making that a little easier. Bronze is my favourite in the series, and probably the one I'd recommend if you want a real challenge, and can only afford one puzzle. You'll not regret it as seeing the core of this puzzle is a work of art. Don't blame me if you spend many hours on this one though. It's a tough puzzle but well worth the effort. I'm asked fairly frequently whether the Blue and Green are needed before solving Bronze. In all honesty, I don't think they are, but the challenge is much tougher if you've not done at least one other Revomaze before attempting this one. 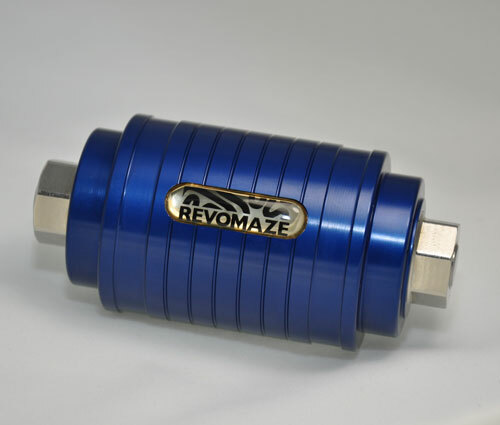 Continuing the Revomaze series, available from Revomaze and also in limited numbers from PuzzleMaster. I've already covered the basic puzzle in my earlier reviews of the Series I puzzles, so for general information on the Revomaze puzzles, I'd suggest reading that post here. 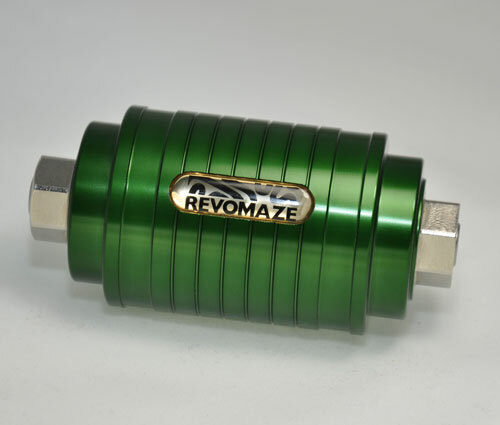 The Black Revomaze, available in both Plastic and originally Metal (although only 20 metal puzzles were produced and are very rarely available for sale from their current owners) was the first Revomaze which was not part of the main series of puzzles, incorporating Blue, Green, Bronze, Silver and Gold. When the engineering company was working with Chris Pitt on the puzzles, they produced the Black as a way to show Chris what they were capable of, and, so the story goes as a challenge to Chris to open a puzzle that he didn't know the route through maze. Chris like the design they created so much that he added it to the line of puzzles to be produced and sold. The reason why, I'll explain later. Similar to the Blue and Green puzzles, the Black is a static maze, however it is much closer to Bronze in execution as the orthogonal lines from the Blue and Green seem to be non-existent leaving only curves and sharp corners. This makes for a very interesting challenge, as some of the sharp turns create very thin ledges to be navigated, increasing the chances of clicking into the ever-present trap lines. The curves also add a challenge to mapping as anyone who has tried to map the Bronze will know already. The real beauty of the Black is the reveal you get either when mapping the puzzle (if your map is accurate enough) or in the metal puzzle when removing the core, and seeing the maze for the first time. I was fortunate enough to be able to borrow one of the few metal versions from a good friend, however due to the way I create my maps, I didn't see the hidden secret in my map until I opened the core (although I had my suspicions!). Once open not only are is the stunning engineering to create the curves revealed, but the maze also contains a the company name! Now it's obvious why Chris liked the black so much, and decided to produce it and allow the public the joy of solving the puzzle as well. As a note on mapping the mazes, the map you create depends on how you view the puzzle. Either the pin can move through the maze, as though it were a person walking inside a huge static maze, or as though the pin were hanging from the ceiling, and the maze were navigated around it. In the puzzle, the pin is fixed in the sleeve, and the maze moves around it, not the other way around. This has two effects, your directions are inverted and also your start and end points are reversed. If you think about the maze itself, the start is actually in the middle of the core, and you work toward the end of the core (the leftmost point is the end). When most people think about a maze, the start at the outside and either work to the other end or the centre depending on the maze, so starting in the middle may not be natural for most. Personally I map from the viewpoint of walking around inside the maze, and as a result all my maps are mirror images of the real maze. At one point when creating a map for the Silver, I took a wooden dowel, and carved the maze onto the dowel, using my excel map as the source. Of course this meant that my map is back to front compared with the real maze, however it did let me think around the problems I was trying to solve! Black is a great puzzle, and really fun to solve. If you're lucky enough to own, or be able to borrow a metal version, the core is really the highlight, but if not, don't pass up the chance of trying a very fun puzzle with the plastic version. 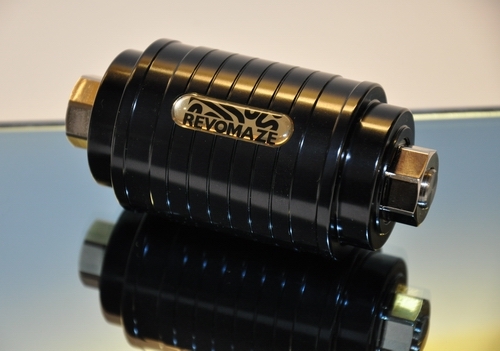 It's been a while since I reviewed a Revomaze puzzle, and since the last time I talked about them, there's been a couple of new puzzles released from Ashton Pitt. We've had a couple of special editions in the form of an Orange, and a Lime, and the final puzzle in the Series 1 set was released. That puzzle was the Gold, and was shipped almost exactly a year ago. 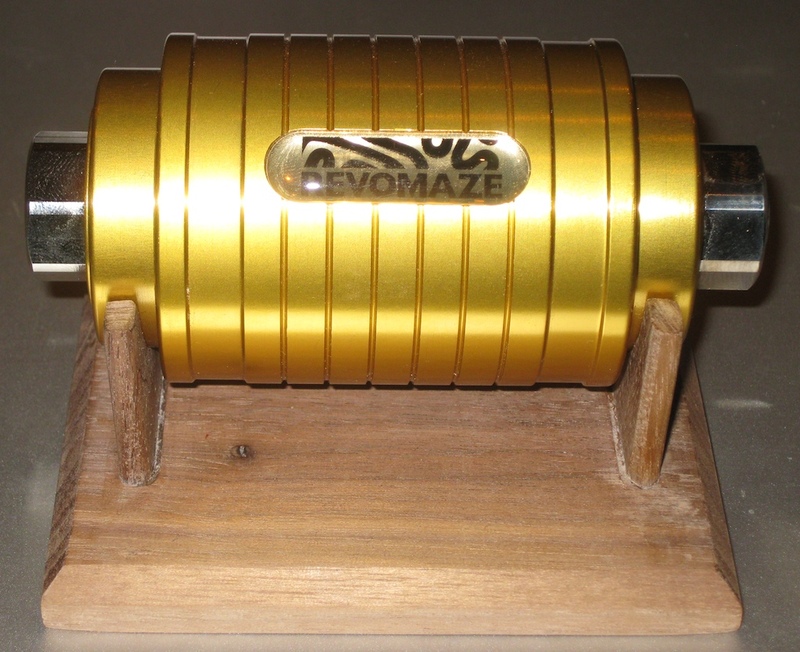 The fifth and final puzzle from Revomaze in the Series 1 is the Gold. This puzzle, like the Bronze and Silver isn't available as a plastic puzzle in the Obsession line, as it's not possible to create some of the internals in plastic. The Gold is rated by Revomaze as having a difficulty of 100/100 (extreme) and an estimated opening time of 250+ hours. The fastest opening so far is listed as 400 hours. It is described as a dynamic maze and is the hardest puzzle to be released to date from Revomaze. Only part of the puzzle is listed as being mechanical. There is also an algorithm, which needs to be solved in order to be able to open the mechanical puzzle. Each Gold is listed as being unique, and I'll talk a little about that later. If you've read the Silver review, you'll remember me talking about the "not-a-canyon", which was an area where the core was able to spin. Something we'd not seen in a Revomaze puzzle previously, and certainly had many of us scratching our heads as to how that could happen. Well Gold starts that way, and really doesn't get much better. Very early on in the puzzle, you'll find yourself going in circles, with the occasional notch you can drop into. You may even find that from time to time that notch isn't a notch, and becomes a path further into the puzzle. At first it doesn't seem to make a lot of sense, and if you're lucky, within a short time, you'll find yourself with the core as far out as you've seen it with any of your other puzzles, but there's no dot, so you know you're not finished. And let's be honest, if the puzzle is rated as the hardest to date, you'd be a little upset if it was that easy. So you've now got the core as far out as you can, but it's not done much for you, and really at this stage you have little idea what you did to get it here. So you decide to go back to the start, and spend some time trying to figure things out. Of course, getting back is almost as much of a journey as getting to where you are! The challenge here is to figure out what's going on and understand what allows you to move from one 'ring' to the next. Like any other Revomaze, this puzzle can be mapped although you probably think that's not true initially. As with any other Revomaze puzzle, I had to sit and map things out, and although it seemed like I'd need to do something special for this maze, it does map out the same as any other and I resorted to my usual Excel based map. Now as I mentioned previously, the mechanical puzzle is only one small part of the Gold, and that is where many people on the Forums have expressed disappointment, myself included. The reason is that in order to open the puzzle, you need to solve an algorithm, in the form of a set of cryptic clues to be able to get a code which can then be applied to the puzzle to let you open it. Sound complicated? Well the clues are certainly cryptic, and will need you to think so far out of the box that as of writing this a year after the puzzle was released, no-one has solved the algorithm to the satisfaction of Chris Pitt. That alone tells you all you need to know as far as I'm concerned. For me, I found the algorithm to be very off-putting. 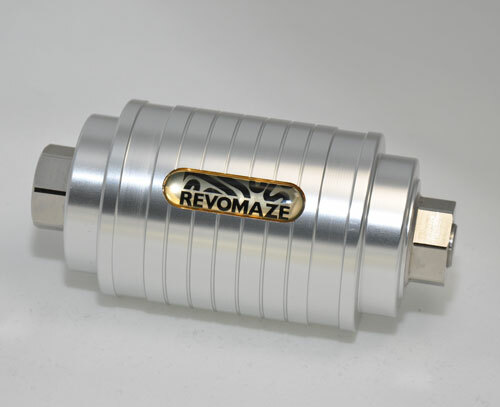 I have loved the Revomaze puzzles from the first one I played with as they are challenging mechanical puzzles. Sadly the Gold is not a mechanical puzzle. It's a combination lock. You get a code, enter it, and the puzzle opens. That may be over simplifying things, but at the bottom line, it's exactly what we have. Chris tried to create a puzzle which could not be opened by cheating, and wanted to have a puzzle were each and every copy was unique. The algorithm allowed him to do that, and with a minimum number of internal parts, each puzzle in the 250 puzzle run could be made unique. Sadly for me, and I know I'm not alone, that also took the Gold away from the original spirit of the puzzle. When you receive the puzzle, and get the algorithm clues, you'll also get a three letter code with the puzzle. When you register your puzzle with Revo HQ, you'll need to send this code as part of the email. From there, you'll receive another three letter code in return. These are the starting point for solving the algorithm and getting the solution code you'll need to open the puzzle. Of course without understanding what's going on in the puzzle, and how you'd apply the code to the puzzle you're not going to get very far. You'll also get a warning that excessive use may damage the puzzle. Given that this was expected to be the most challenging puzzle, with over 250 hours of puzzling expected, what exactly is excessive use. It turns out that the warning was issued because there was some discussion about brute forcing the puzzle by trying every possible combination (in theory 25^3 or 15,625 combinations). I don't think you're going to damage the puzzle by trying to solve it, but perhaps trying 15k+ combinations is excessive! There are clues and useful markers inside the puzzle for the observant puzzler, and there is a lot to learn in the puzzle. I lost track of how long it took me to open the Gold, however I finally opened my copy in August 2012, after playing on and off (mostly off) for eight months. I was number 7 to open the puzzle and there have been only 15 puzzles opened in total so far. Strangely enough the puzzles being opened are a little like busses. There are none opened for ages, and then four come along at once. Having opened it, I think it's fair to say that it is a challenging puzzle, and may well be the most difficult Revomaze released to date. There are certainly fewer people have opened Gold than any other Revo. I don't think it's my favourite in the series, and for me Bronze still holds that spot. Oh, and there is no dot on the shaft if you were looking for one. The review wouldn't be complete without me mentioning a few of the issues that have been discovered since the puzzle was released. There have been a few puzzles which had to be returned to HQ for repair, and it is possible to get the puzzle in a state where it is jammed, and you can't navigate through the puzzle. In most cases, this can be easily fixed without having to return the puzzle, but as with anything that may not always be the case. As with any of the Revo puzzles, excessive force is not required, and could damage some of the parts inside the maze. I've spoken with many other people who have been working on the Gold puzzle, and many people have expressed opinions about their experiences. This puzzle is not for the faint of heart, and will test you far beyond any other puzzle in the series. Just be sure that you're willing to spend a lot of time thinking and working on the algorithm before you take the plunge and get one. My personal feeling is that the Gold was a let down, and not the pinnacle of an excellent series of puzzles as it should have been. Chris I know has learned a lot from this, and will go on to bigger and better things I'm sure. If you're still working on the puzzle, and don't want to know more, then I'd stop reading now. The remainder of the review is rather candid, and may reveal a few things about the puzzle that you might not want to know.